Can a MacBook Replace a 12" PowerBook? Was Wireless USB Worth the Wait? "I bit the (again, virtual) bullet and bought a MacBook (a very fine 2 GHz unibody model that I promptly outfitted with 4 GB of RAM). Overall, I'm thrilled with my purchase, but a few things took me by surprise...."
Link: Can a MacBook Replace a 12-Inch PowerBook? "Microsoft's 'Laptop Hunters' commercials have generated lots of Mac vs. Windows PC debate. Surely there can't be enough, so I'd like to generate even more. Quite unexpectedly, I'm a PC. "I'm a PC, and I just can't believe it." "When we put our MacBooks to sleep, we hope that they will wake. Please! And we when we want them to go to sleep, we hope that they will slumber. But it always doesn't work that way. 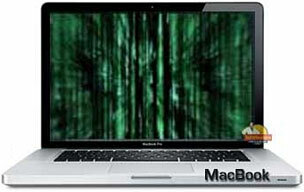 "When running under Mac OS X Tiger (10.4), I occasionally encountered problems getting my MacBook Pro to wake from sleep. I found the following procedure helps...."
"As the world of personal electronics grows increasingly mobile, issues surrounding battery life, lifespan, and consumption are becoming hot topics for users and manufacturers alike. Rechargeable lithium-ion batteries are the standard power source for many of our favorite Apple products: portable notebooks, iPods, and iPhones. Although at some point all rechargeable lithium ion batteries will fail, there are some tips and practices that can help extend the life of one of the most valuable components of your mobile experience." The article has sections of tips for prolonging battery life with iPods, iPhones, and notebooks. "About three weeks ago, the keyboard and trackpad on my MacBook Pro (from mid-2007) began failing randomly for no apparent reason. I would turn it on only to find its keyboard and trackpad unresponsive to any input. Rebooting sometimes helped, but many times it did not. Without a reproducible pattern I could determine, it was impossible to know if the problem was caused by failing hardware, a software conflict, or both...."
"Apple has gone through great lengths to be at the cutting edge in terms of input devices, particularly with its laptops. With the MacBook, Apple introduced and evolved the multitouch capabilities and has invested heavily in research and development to ensure the feel and functionality are as flawless as possible. For the majority of people, this effort has paid off; however, for some, there reports or erratic trackpad behavior...."
"How do you people get through the day? "The little Inspector panel here in my word processor reports that this question is only 63% rhetorical (good God, is there anything that Scrivener can't do?). I have a good half-dozen working computers in my office and there are times when bringing you a column is like getting a sack of mail from Plum Creek, Nebraska to Sacramento, California. I ride one computer until it collapses or shies up lame. Then I jump off, grab my mochilla from my exhausted mount, and jump onto the computer that ll carry me for the next ten miles or so. "Generally I keep this up until my work is done, or I run out of working computers. Some days, I get to go to the movies at one in the afternoon. "So honestly, I have no idea how you folks manage with just the one computer . . . If I only had two, I d keep the second one mounted on the wall under a pane of glass and would only break it out in case of a zombie attack or something...."
"You have to admire the people who make laptops. Every time you use one, you prominently display the logo of the laptop maker every time you use it. So every time I am using my laptop at a coffee shop or library, I am a sitting advertisement for Toshiba! "MacBooks may not have the word 'Apple' written on them, but that picture of the fruit with a bite taken out of it is probably better than any company name. In today's society, images are more powerful than words. "Designer Eddie Zarick has found a way to put that Apple logo on the front of a MacBook to good use by figuring out how to make the logo into an LCD screen. 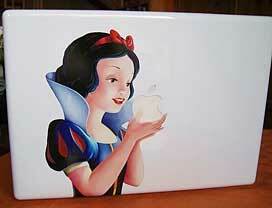 This is a total DIY project, but he has posted instructions for any DIYer on his Ed's Junk site...."
"In what could possibly be the coolest MacBook cover ever, Flickr user LubeckerJung put a picture of Snow White holding the Apple logo. For those not familiar with this fairy tale, Snow White bites into a poisoned apple and falls into a coma, awakened only by some prince later on. The one thing that would make this mod even better was if she was standing on the right, so the bite would be on the correct side...."
"Apple has finally updated its flagship 17in model with its unibody design. It's a looker alright but how does it fare for performance and value? "Apple's products are some of the most divisive and compelling in the industry, so it's no surprise that the 15.4in MacBook Pro prompted plenty of debate. The good looks, solid design and build were offset by a number of niggles: some disliked the scrabble-tile keyboard, others baulked at the non-removable battery, and plenty didn't approve of the unusual button-free trackpad. "The latest MacBook Pro comes with a considerable list of pros and cons. The stunning, high-resolution screen, powerful hardware and superb build quality will endear the 17in Apple to those keen on image and video editing, or simply those just looking for a luxurious desktop replacement. Conversely, the keyboard and trackpad are a mite disappointing and the specification isn't as versatile as rival machines...."
"As the Universal Serial Bus (USB) approaches its 13th birthday, like other adolescents it's eager to start thinking and acting independently. For the USB, this means chucking the cable and connecting to a wide variety of printers, keyboards, hard drives and other office peripherals without wires. "To see what's possible with WUSB, I collected several currently available WUSB devices: hubs by D-Link and IOGear; the Cables Unlimited Wireless USB Adapter Set; and two video kits: Imation's Wireless Projection Link and IOGear's Wireless USB to VGA kit. I tried them out using a Dell Vostro 1510 notebook..."
Link: Wireless USB: Was It Worth the Wait? PR: TechRestore is now offering the only "Factory-Fit" flat-rate overnight LCD screen replacement service for aluminum Unibody MacBook 13" systems that have a cracked LCD screen. The new service is available immediately with repairs arriving daily to the TechRestore secure repair facility in Concord, California. The flat-rate overnight LCD screen replacement service for aluminum Unibody MacBook 13" systems is performed by TechRestore certified technicians that have made it their mission to provide the fastest repair turnaround time with unmatched customer service to all Mac owners throughout the United States. Once an Aluminum MacBook arrives to TechRestore, a repair professional inspects the system and alerts the customer to the fact that their Aluminum MacBook has arrived safely to our repair center. The LCD screen is then replaced within 24-hours of receipt, using a proprietary removal and bonding process to insure a true Factory-Fit screen replacement that is not possible at other repair centers. The flat-rate price of $399 includes a brand new LCD screen, professional installation, a 1-year warranty and free shipping vs. the $800 standard charge for a similar repair from Apple. TechRestore technicians are uniquely qualified to perform LCD screen replacements on the Aluminum MacBook Unibody systems due to their engineering knowledge that was developed for the TechRestore Matte Finish Screen replacement service for all Unibody MacBook and MacBook Pro systems. This service was awarded a Macworld Expo 2009 Best of Show award and has been reviewed and featured in publications throughout the world. The MacBook and MacBook Pro Unibody systems require removal of a sealed glass covering prior to replacing of the LCD screen. TechRestore's exclusive method and proprietary equipment insure a Factory-Fit LCD screen replacement. TechRestore offers free shipping on all approved repairs and we perform overnight service on MacBook, MacBook Pro, PowerBook and iBook computers. In addition, our consumer electronics division performs overnight repair on iPod Classic, iPod Touch, iPod Video, iPod Nano, iPhone, Sony PSP and other gaming systems. Their network of over 2000 local pickup locations often offers convenient pick up of your product in your neighborhood. TechRestore is certified by and follows the strict guidelines of the Bureau of Electronics Repair and all TechRestore certified technicians are professionally trained and many carry advanced electronics degrees. Some early 2008 MacBook Pro's back this week, plus a full slate of refurb. unibodies save for the 17-incher.